The National Gambling Board's (NGB) human capital philosophy is informed by the Constitution of the Republic of South Africa, the Board's legislative and strategic mandate as well as the human capital development best practices. The NGB believes that human capital is the most valuable asset it has in order to achieve its mandate. In this context, human capital refers to the combination of skills, knowledge, attitudes and the consideration of the Board's values that enable organisational culture. The NGB's values of professionalism, moral integrity, transparency, commitment, consistency, effective implementation of resolutions, responsive communication, team work, respect and tolerance define its organisational work life towards realising its corporate strategic objectives. It is therefore important for NGB employees to live and abide by these values in the daily life of the organisation. 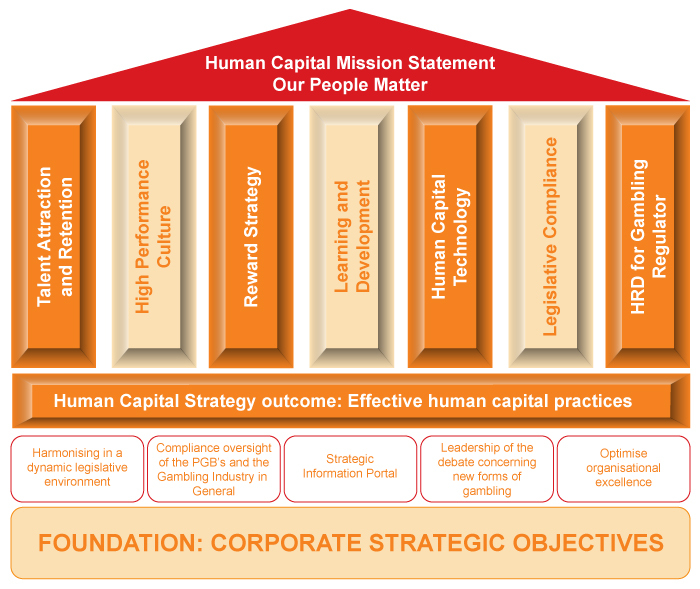 To optimise its human capital the NGB has in line with the revised corporate strategy adopted the following strategic human capital pillars: Talent Attraction and Retention, High Performance Culture, Competitive Reward Strategy, Learning and Development environment, latest Human Capital Technology, Labour Legislative Compliance and Human Resource Development for Gambling Regulators.